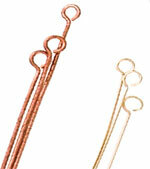 Eye Pins are wires with a loop on one end and a straight portion of wire where beads can be strung. Length and gauges vary; most earrings use 24-gauge eye pins from 1 1/2 – 2 1/2 inches. Head Pins are a piece of wire with a stop end like a fine nail head. A bead slides onto the head pin and stops on the head. Lengths and gauges vary; most earrings use 24-gauge head pins from 1 1/2 – 2 1/2 inches. 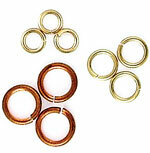 Jump Rings are one of the most versatile findings used in jewelry-making. They come in all sizes, gauges and metals. They are measured by diameter (width) and gauge (weight). Ear Wires come in many different styles. Regular fishhook style are the most common and the easiest to make yourself. Recommended weight for ear wires is either 22- or 20-gauge. 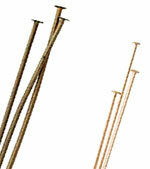 Crimp Tubes are small soft metal cylinders that can be flattened or formed around flexible beading wire to secure the ends. They are an essential component for bead stringing projects. Wire comes in many sizes or gauges. Gauge is the measured diameter of the wire. The higher the number, the thinner the wire. Wire can be tempered soft, half-hard or hard, which refers to its stiffness. 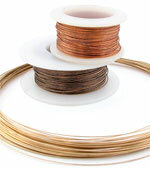 Copper, silver and gold-filled are most commonly used for jewelry. 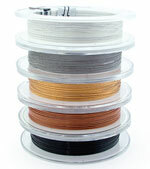 Flexible Beading Wire comes in several weights from .010 - .026-inch diameter and is designed for stringing. It is available in precious metal and several colors and is made from 7 to 49 strands of steel wire, twisted and encased in a flexible plastic coating. Ends are finished with crimp beads using either crimping or chain-nose pliers. If you want to make your own jewelry or try beading, then sign up for Annie's Beads & Jewelry! You'll learn about kits, patterns, techniques, supplies and more. Learn more about the Annie's Beads & Jewelry update and many others.